Learn why you should — and maybe why you shouldn't — draft players 11-20 in our consensus rankings. The Case For: Everyone's favorite breakout candidate really broke out in 2018, and he did it by simply taking a step forward in every facet of his game. He increased his fly-ball rate a few points; his hard-hit rate ticked up; his strikeout rate ticked down. Put it all together, and Bregman, well, put it all together. He looks like a player without any real flaws, and one who can reasonably contribute in all five categories. The Case Against: Honestly, you can't really build a case against Bregman at this point. This is the kind of skill set that seems built to last. The best case I can make against him is that Anthony Rendon can probably give you 90 percent of Bregman's production three rounds later. Alternately, Ozzie Albies might have even more upside than Bregman at a similar cost to Rendon, though his second-half slide last season should give you pause. This might be one case where you're better off just buying the name brand. The Case For: It probably won't matter much where he ends up signing, because Machado is a legitimate top-flight hitter. He's hit better than .285 in three of the past four seasons, and has at least 33 homers in each season in that span. The steals tend to come and go for Machado, but he swiped 14 last season, so he'll help you there. There really isn't a hole in his game. The Case Against: That being said ... it might matter where Machado signs. He slumped to a .273/.338/.487 line with the Dodgers after being traded, and has a .295/.353/.534 line in his home career, spent mostly at Camden Yards, compared to a .271/.319/.442 mark on the road. The Case For: Sale was better than ever in 2018, sporting a career-best 2.11 ERA, 0.86 WHIP, and 38.4 K%, the best in baseball history for a pitcher with at least 150 innings. Sale was blowing hitters away, averaging 98-plus mph with his fastball and regularly hitting 100 for the first time by midseason, and he still holds the MLB career record for K/9 and K/BB ratio. He's as good as they come. The Case Against: But, there's a reason I had to add that 150-inning qualifier for Sale's K%. He only threw 158 innings, and saw a dramatic drop in his fastball velocity around the time he went on the DL with a shoulder issue. Before Sale went on the DL he was averaging 96.1 mph with his fastball. After coming back, he averaged 93.9 mph with his fastball. If he's back in spring training throwing in the low-90s, he might have to move down draft boards. The Case For: Yelich belonged in the Betts/Trout class last season, when he hit .326/.402/.598 with 36 homers, 110 RBI, 118 R, and 22 steals. Getting out of Miami helped Yelich tremendously, as he went from hitting .281/.364/.400 in his old home park to a .324/.406/.655 line in Miller Park. It's a great place to hit and a great lineup to hit in. The Case Against: Of course, Yelich belonged in the Betts/Trout class last season, but it was his first year in that sort of rarefied air. Miller Park certainly helped, but Yelich had a lot of help that he might not be able to count on in 2019, beginning with a .373 BABIP (.359 career mark) and a 35.0 HR/FB rate (20.3 career mark). Placing him at No. 10 is baking in plenty of regression from his 2018, but Yelich was more of a fourth- or fifth-round pick before this season. He may belong in the Ramirez/Lindor class by the end of this season, but it's always risky to bet on a career year. The Case For: Goldschmidt got off to a slow start in 2018, but he went on a tear from June on, hitting .330/.420/.602, making up for that slow start to end up just about where you expected him to be in the end: .290-95-33-83-7. OK, the RBI and runs were way down, but that shouldn't be a problem in St. Louis, a team that finished fifth in the NL in runs scored before adding Goldschmidt. Expect the counting stats to tick upward, and for his power and average to return to pre-'18 levels now that he's out of the suddenly stingy Chase Field environment. The Case Against: He's older than you probably think at 31, and his skill set did seem at least a little diminished in 2018. Goldschmidt stuck out at a career-high rate and hit infield fly-balls at a higher rate than his career average. Those would certainly be signs of an aging hitter, as would his 11 stolen base attempts, his lowest number for a full season ever. If he starts to slide a little bit more in 2019, he runs the risk of becoming a more pedestrian first-base option. The Case For: I could probably start and end with: "He had the lowest ERA for a starting pitcher since 2013, and the fourth-lowest of the past 30 years" and just move on, but I want to put the work in. Because deGrom deserves it. 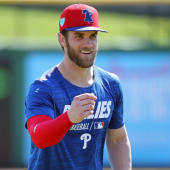 He was essentially unhittable in 2018, sporting a 32.2 percent strikeout rate and 5.5 percent walk rate, and allowed just 10 homers all season. He sported the lowest FIP and xFIP in baseball, while ranking third in SIERA, so the advanced stats back him up too. deGrom put together about as good a season as you could possibly ask for in 2018. The Case Against: But it was just 2018. Not to say deGrom will be a flash in the pan, but he'll likely regress at least a little bit. Does that mean he can't be one of the best pitchers in baseball? Of course not. He has been one of the best pitchers in baseball since 2014. But his season was almost identical to Zack Greinke's 2015, when he sported a 1.66 ERA over 222.2 innings, and he regressed to a 4.37 ERA the following season. I'm not expecting that to happen with deGrom, but it's a good reminder that sometimes the stars align for a player all at once in a way you can't expect again. The Case For: Freeman is going to hit .300 in 2019. How do I know that? Because he hasn't hit below .302 in either of the past three seasons. He's also going to hit a ton of doubles, and he'll get at least 20 homers because he does every year. He even stole 10 bases last season, the same amount as Bregman. In fact, there might not be much difference between Bregman and Freeman — especially in an era where third base and shortstop might be deeper than first base. The Case Against: Is Freeman a little ... boring? There was about a year and a half where Freeman looked like he was going to take the leap to "Best Hitter In Baseball" status, but he fractured his wrist in 2017 and just hasn't been the same guy. He's been good, to be sure, but he only really stands out in batting average. Of course, this is a bad criticism; There's nothing wrong with going with old reliable while everyone else chases the shiny new thing. The Case For: Justin Verlander is basically the AL's version of Max Scherzer, in that you just have to buy in until he finally stops producing. He's topped 200 innings in 10 of the last 11 years, and has turned into arguably a better pitcher than ever since joining (yep, you guessed it!) the Astros. He's cut his walk rate down to a microscopic 4.4 percent, and he struck out 34.8 percent of batters in 2018. He was about as good as you can get, and you've gotta keep betting on the Astros to wring the most out of him. The Case Against: He'll be 36 on Opening Day. And the downside of all those 200-inning seasons is Verlander's got a lot of pitches logged on that arm. And thanks to deep playoff runs, he's added 54 additional innings to that arm over the last two seasons. You have to buy in until he finally stops producing, but you also can't forget this adage: Father Time is undefeated. The Case For: Speaking of the "shiny new thing," I don't think there's any chance Acuña actually falls to the middle of the second round in any draft this year. There's going to be one person in your league who reaches for him in the middle of the first round, and it might not be such a bad idea. After all, Acuña was arguably the best player in Fantasy in the second half when the Braves unleashed him on the bases out of the leadoff spot. His second-half numbers translate to a .301 average, 131 runs scored, 46 home runs, 109 RBI and 34 SB. Eat your heart out, Mike Trout. The Case Against: For one thing, chasing half-season stats is an amateur move. More importantly, Acuña's production was extremely dependent on his spot in the batting order, at least as a base runner. He stole 14 bases in 66 starts out of the leadoff spot, compared to two in 42 starts in any other spot in the lineup. Of course, if Acuña hits like he did in the second half, it won't matter if he doesn't swipe a base -- he'll be a steal anywhere you draft him. However, there's still quite a bit of swing-and-miss in his game, and half-season results aren't typically predictable. Someone will draft him in the first round, but if you're risk-averse, it won't be you. The Case For: Judge took a step back in 2018, by which I mean he was merely awesome instead of the best hitter in baseball. After two years it's hard to argue Judge isn't one of the best hitters in baseball, even if he does it in an unorthodox way. Yes, he strikes out a ton (above 30 percent in both seasons), and yes he relies on an incredibly high BABIP (.356 for his career). But he backs it up with elite batted-ball skills, sporting the highest average exit velocity in both of his full seasons. The Case Against: The floor seems pretty high thanks to Judge's power, as well as the lineup he plays in. But we were saying the same thing about Chris Davis after his breakout 2013 season, when he led the majors in homers, RBI and total bases with elite batted-ball skills and a strikeout rate that fell just a bit short of what Judge has managed in his career. Davis didn't entirely fall apart until the past two seasons, really, but he followed up his massive 2013 with a miserable 2014 as he dealt with injuries and was struck down by the BABIP gods before bouncing back in 2015. I'd like to think Judge is too skilled to suffer that same fate, but he still has a volatile profile.